CENTRAL NEBRASKA'S FIRST EVER PAINT PARTY!!! 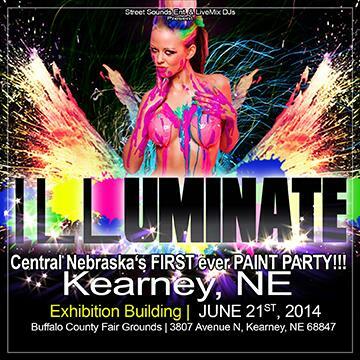 After SOLD OUT paint parties in Lincoln and Omaha...Nebraska's very own Paint party comes to Central Nebraska (Kearney). Providing fans the perfect escape from their everyday lives! be ready to lose yourself in a Paint experience never seen in central Nebraska! Be ready for Hundreds of Gallons of Paint to be splashed all over you! !